Dubai, UAE, July 10, 2018: Superbrands, the independent authority and arbiter of branding, recognized the Dubai Police for its efforts in exceeding the standards set in its brand mission statement over many decades and the Apparel Group for its ‘Distinguished Services to Retail Branding’ at the 14th annual Superbrands tribute event, which was held at the Intercontinental Hotel in Dubai Festival City. Maj. Gen. Mohammad Saeed Al Marri, Assistant Commander for Society Happiness & Equipments, Dubai Police and Mr. Neeraj Tekchandani, Group Chief Financial Officer of Apparel Group received the special recognitions. 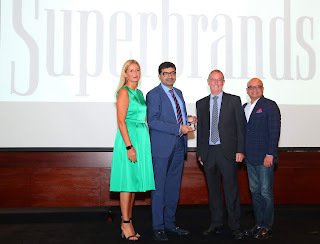 Fifty-nine leading brands from the UAE were awarded Superbrands status and the 2018 Superbrands book was unveiled at the event, also dubbed the ‘Oscars of Branding’, where the UAE’s strongest brands were honoured. “Built on five pillars - transparency, cooperation, justice, professionalism and team spirit - Dubai Police has strived to offer its citizens and residents the highest level of security a safety despite the presence of many different nationalities and cultures. Over the years, Dubai Police has succeeded in establishing good relations in a community with many races, nationalities and social backgrounds, while providing security and safety across the city and protecting the rights of individuals and organisations. Dubai Police has become synonymous with being trustworthy, approachable, innovative and proactive and it is with great honour that we bestow upon the Dubai Police the special recognition for its success in protecting the community while maintaining a very human touch, said Mr. Mike English, Director, Superbrands Middle East. Dubai Police, established in 1956, is considered to be one of the best security institutions, at all levels; locally, regionally, and globally, with a force of more than fifteen thousand employees who are characterized by their degrees of high-level multi specialties and training. Established in 1999, the Apparel Group is a global fashion and lifestyle brand conglomerate with a strong presence not only in the UAE, Kuwait, Qatar, Bahrain, Oman, and Saudi Arabia but has also opened thriving gateways to market in India, South Africa, Poland, Singapore, Jordan, Indonesia, Thailand and Malaysia. The Group has clear and defined strategies in place to enter emerging markets such as Hungary, Pakistan, Egypt and Philippines. The Apparel Group operates brands from around the world, originating from USA, Canada, Europe, Australia, Asia and include leading names in fashion, footwear and lifestyle such as Tommy Hilfiger, Juicy Couture, Nautica, Aldo, Nine West, Aeropostale Tim Hortons, Cold Stone Creamery, Inglot, Rituals to name a few. With over 2,000 leading brands in the UAE vying for the coveted Superbrands title, only fifty-nine scored more than 80% of the total possible mark and were declared Superbrands by the Brand Council. Winning this accolade is a powerful endorsement and evidence for existing customers, potential customers, the media, suppliers, investors and employees of each brand’s exceptional status. This year, Superbrands were voted not only by the brand council but also by online voting, which has expanded the voting base to almost 2,000 senior managers and marketing professionals. "This year it is heartening to see so many local home-grown brands and some new entrants in the market make it into the Superbrands UAE book in addition to internationally recognized brands. To be voted a Superbrand is a powerful endorsement and is evidence for existing customers, potential customers, media, suppliers, investors and employees of each brand’s exceptional status,” Mr. English concluded.